Cartagena is an ancient port - the city served as Hannibal's Spanish headquarters during the 2nd Punic War with Rome. The city remained a major trading port under the Romans and the Moors. 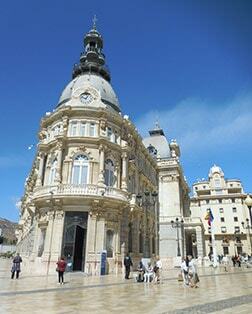 Today, Cartagena is Spain's principal naval establishment and the site of an annual international maritime festival. The city is also your gateway to the Costa Calida, a region that boasts some of Spain's mildest weather along with 175 miles of beaches. The old castle is home to a museum chronicling Cartagena's long maritime history. This section of the city's old walls dates from Carthaginian days. The regional capital is noted for its mix of Baroque and 18th-century architecture, its Salzillo Museum, and its legendary Holy Week festival. The city is famed for its citrus fruits. Founded in the 17th century, the sanctuary is home to the Virgén de Fuensanta, Murcia's patron saint. Sculptor Francisco Salzillo was renowned for his life-sized wooden sculptures, especially the figures he created for Murcia's famous holy Week processions. This old Moorish town is home to an extensive palm forest and the Heurta Del Cura, an elaborate and beautiful Moorish garden. The Moorish gardens are home to exotic palm trees, lakes, fountains and pavilions. During the Middle Ages, Lorca was a fortified frontier town marking the boundary between Christian Castile and Moorish Spain.